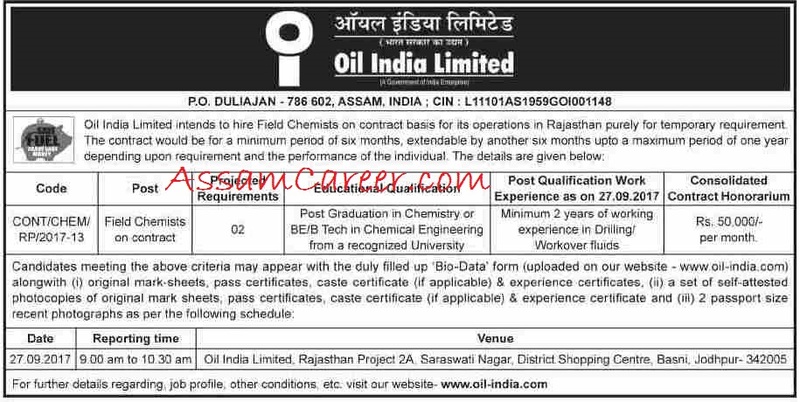 Oil India Limited, Duliajan, Assam intends to engage Field Chemists on contract basis for its operations in Rajasthan purely for temporary requirement. The contract would be for a minimum period of six months, extendable by another six months term, for a maximum period of one year depending upon requirement and the performance of the individual. Pay: Rs. 50000/- per month. Educational Qualification: Post Graduation in Chemistry or BE/BTech in Chemical Engineering from a recognized university and minimum 2 years of working experience in Drilling/ Workover fluids. Walk-In-Interview: Interested candidates should attend the Interview on 27/09/2017 at 9.00 to 10.30 am at Oil India Limited, Rajasthan Project 2A Saraswati Nagar, District Shopping Centre, Basni, Jodhpur - 342005 .